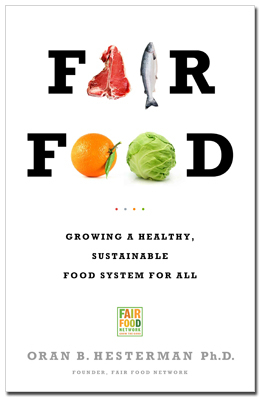 Oran Hesterman book, Fair Food: Growing a Healthy, Sustainable Food System for All, which was published this week, is a book of action. An informative and motivating read, Hesterman picks up where Michael Pollan and Eric Schlosser left off. Don't get me wrong, Pollan and Schlosser with their best selling books, Omnivore's Dilemma and Fast Food Nation, created tremendous awareness about our broken food system. Hesterman takes their solid groundwork to the next step and shows the reader not only how to support local food systems with farmers markets and other direct marketing models, but also shares examples about organizations and farms that are re-creating the local and regional infrastructure to address not only supply chain, good ag and production issues but also social justice, health and environmental issues. With chapters addressing fairness, crop diversity, soil health, green economies, activism and policy, Fair Food is not just for food activists and policy wonks (although there is some food for thought for even the most knowledgeable of the food revolutionaries). Rather, a general audience, much like those who devoured Pollan and Schlosser, will find Fair Food to be a good read with a balance of statistics, US agricultural history, story telling, activism and innovative business models. Fair Food is about the people restructuring and revitalizing food systems for a healthy and prosperous future. In my view, the 41-page Resource chapter alone is worth the $24.99 cover price. A must read for eaters and advocates alike (besides it was fun to see so many of my colleagues and their organizations mentioned in the book). Michel Nischan/Wholesome Wave (CT): I had the pleasure of co-hosting the 2011 awards ceremony for International Association of Culinary Professionals where Michel, chef activist, was awarded the Humanitarian of the Year award for his tireless work to make healthy, fresh and local food more available to SNAP (food stamp) recipients by pushing through program and policy issues around not only making it easy to use food stamps at farmers markets but giving shoppers a bonus for doing so with "Double Value Coupon Program"
New York City Green Carts (NY): mobile food carts selling fruits and vegetables. An entrepreneurial enterprise that improves access to healthy foods in under served communities. I am proud to have connected New York City's Department of Health and Mental Hygiene, the sponsor of Green Carts, with my business school, Kellogg/Northwestern. You can buy the 12-page case study, A City’s Desert: No Apples in the Big Apple? written by Professor Jamie Jones, here. American Farmland Trust (NY, national): local offices around the country are working to address the policy, land use, development and tax issues around farmland preservation. Connecting federal, state, and local dollars they help set up land trusts to preserve acreage for growing crops in perpetuity. Ben and Jerry's (VT): Hesterman used this social and environmentally conscious ice cream producer as an example of a regional company that sold out to a multi-national corporation (Unilever). He also mentions Cascadian Farms organic (General Mills), Stonyfield Yogurt (Danone). My husband, Henry F. Owsley and his firm, Gordian Group, represented Ben Cohen and Jerry Greenfield including negotiating a contract that stipulated that Unilever was to buy high quality dairy from local farms, fair trade and all natural ingredients, and continue their social marketing culture. Sadly, 11 years later, news headlines reveal that Ben and Jerry's contains high fructose corn syrup and other chemically modified ("unnatural") ingredients. Mark Winne: Book author, frequent speaker, including last weekend's panel "Building Sustainable Food Communities" that I co-curated with The Culinary Trust at International Association of Culinary Professionals conference in Austin, and food policy council "rockstar" (sorry Mark, couldn't resist). Slow Food USA: a global, grassroots movement with thousands of members around the world that links the pleasure of food with a commitment to community and the environment. Check out the article in the Sag Harbor Express "Slow Food for Bridgehampton" -- I was a featured speaker at one of many "lunch-ins" to support increasing funds for school lunch and Child Nutrition Reauthorization act. The Resource Chapter includes other great food advocates: Civil Eats , Eat Well Guide , Edible Communities Publications (Manhattan, Queens, East End), Sustaintainable Table , Just Food, Wholesome Wave, WhyHunger , Added Value/Red Hook Farms, Growing Power (Will Allen and I were on a panel together at Kellogg/Northwestern in last month), MarketUmbrella.org (my husband's cousin, Richard McCarthy, founded New Orleans farmers market and is active in preserving Louisiana's seafood and farming culture), Intervale Center, Feeding America (Executive Director Vicki Escarra and I were on the same panel with Will Allen), Chef Ann Cooper, "Renegade Lunch Lady"/Let's Move! Salad Bars to Schools and also a panelist on IACP's "Building Sustainable Food Communites". More on Fair Food Network (formerly Fair Food Foundation): Back in 2008, I wrote about the Fair Food Foundation on Lighthearted Locavore "Fair Food Foundation Closes Due to Madoff"